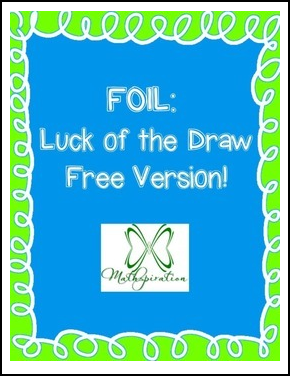 Differentiate and add versatility to helping students practice multiplying binomials with the FOIL technique. This version includes the easy level strips, but not the medium, or challenge levels which allow further differentiation according to skill/ability level. If you would like to further differentiate you should purchase the full version! Students will draw two binomial slips from the difficulty level they are using and then FOIL the binomials on the strips. Students will then return the slips to the cups and draw again. 1) General practice where students can work in groups, pairs, or individually. a. You can separate students into ability groups for tiered differentiation. b. Set out all three levels (labeled on the cups) in the room and allow students to choose which sets to use. d. Or use stations for students to progressively build up to more challenging problems. 2) As a game in small groups where students can race to find the solution based on the slips drawn. The other group members also complete the problem/check the solutions and act as referees. Students can take turns racing and refereeing. 3) As a game in a whole class setting where student race to find the correct solution and the rest of the class follows along, or the whole class responds with individual white boards. Or the class can race the teacher. Included in the activity is an answer sheet for students to record their responses. Suggestions to expand the activity and include higher level thinking and easy level binomials strips (color coded only). There is no answer key provided because the nature of the game creates a large number of possible correct answers...too large to effectively check with any answer key. Exponent Rules: My Favorite No! You get one TpT Credit for every $ you spend on TpT. Every 100 Credits is worth $5 that you can apply towards future TpT purchases. They can really add up!